...I find that many Otus drawings catch my attention, and stick in my mind far longer than other early rolegame artists do. His style evokes the exotic and the macabre in a way that few other artists can match. Welcome to the web page I have devoted to my favorite creator of gaming-related art, Erol Otus. My love for Mr. Otus’ work no doubt has something to do with nostalgia. 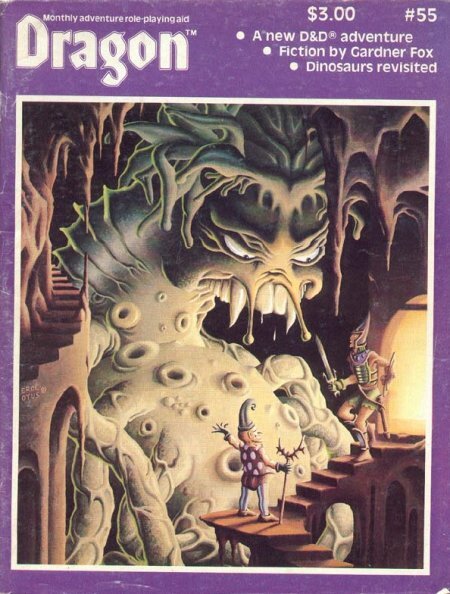 My first role-playing game was the 1981 Dungeons & Dragons Basic Set, for which he did the cover art. Certainly I am still fond of his contemporary TSR artists such as Dee or Darlene, but Otus stands out as having a unique vision for fantasy art. Please note that I am not an artist, nor a trained art critic, but merely a fan that has meditated upon these works and other game-related art contemporary to it. The opinions on these pages are mine alone. 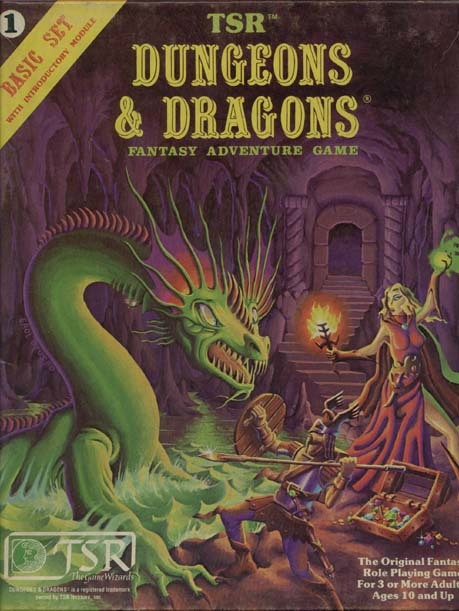 From the cover of the 1981 Dungeons & Dragons Basic set. The setting is underground (i.e. a dungeon). Apparently our heroes have just descended to a lower level via the stairs in the background. More adventures undoubtly lurk in the caves beyond. The reward of success (treasure) is clearly visible. The sorceress holds a torch. Lighting can be a big issue in the game. To view more pieces from the D&D Basic Set click here. To view Erol's work on the D&D Expert Set click here. To the best of my knowledge Otus’ work graced the cover of only a single issue of Dragon, number 55. (Email me if you know of more!) Notice how Otus takes a fantasy staple (hero meets wizards, who deploys dragon* against him) and turns it into something unique. Otus seems to use two general types of wizards in his works: a more stock guy in a robe and this little fellow. I call him the Bald Jester. Clearly he’s meant to be a wizard (I’ve seen him in another piece casting a spell) but the presentation diverges delightfully from the norms of the wizardly type. The hero/warrior/fighter figure strikes me as typical of Otus and atypical of many other artists. The armor seems more evocative than functional. Interesting stylized helmets are also typical of Otus’ work. This piece nicely highlights the architecture of the underworld as well. The winding staircase to the left of the piece suggests even more adventure awaits of hero beyond this daunting challenge. As with the ’81 Basic set above, I appreciate the attention paid to lighting as an artistic understanding of a game reality. Erol Otus also did some interior illustrations for Dragon magazine. To view them click here. *Please don’t email me to tell me that’s not a dragon. I’m interpreting it as such based upon the context and the larger themes of fantasy art. If you want to call it a summoned demon instead, no skin off my back. This piece is from the cover of Advanced Dungeons & Dragons adventure module D3 Vault of the Drow. Again I see good use of architecture. The hero again wears a garish helmet and light armor. I quite enjoy the "lightsabre" effect on the magic sword. Like the D&D cover, we see good use of the actual game material: a drow on the cover wielding a drow special weapon (the tentacle rod). For more Otus module illustrations, click here.